Upcoming Offers from MS Press! Here’s some new offers in market that your community can take advantage of. Feel free to share it along. We’re pleased to announce the availability of Rethinking Enterprise Storage: A Hybrid Cloud Model (ISBN 9780735679603), by Marc Farley, as a free download! Download the 120-page PDF, EPUB, MOBI. We’re very excited to announce another free ebook offering from Microsoft Press. Introducing Windows Server 2012 R2 Preview Release (ISBN 9780735682931), by Mitch Tulloch with the Windows Server Team, introduces new features and capabilities, with scenario-based advice on how the platform can meet the needs of your business. As you might have seen, Microsoft Press published a new free ebook this week: Rethinking Enterprise Storage: A Hybrid Cloud Model. Below is a quick Q & A with the author about the book. Enjoy. Q: Why is Rethinking Enterprise Storage an important book for people to read now? Cloud services are the next big thing in computing. Everybody wants to figure out how to use the cloud or participate in the transformation that cloud computing provides. My book describes how businesses can use the cloud to simplify and manage one of their most important infrastructure elements: data storage. Storage might not be the first thing that pops into a person’s head when they think about cloud, but the changes being brought to storage from the cloud are just as profound as the changes being brought to any other aspect of information technology. Didn’t make it for the live sessions? Don’t worry. You can always find recorded Jump Starts on the latest technologies at the Microsoft Virtual Academy. Lots of new and information around our new releases of Windows Server 2012 R2, System Center 2012 R2 and updates to Windows Azure and Windows Intune. One of the cool new capabilities we’re included with Windows Server 2012 R2 is something called "Work Folders" for the enterprise. 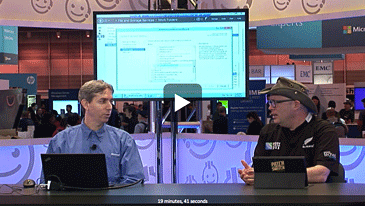 To explain this concept and show off how simple it is to set it up – Rick is joined by Nir Ben Zvi, Program Manager on the Windows Server Team. Allows users to have their work data distributed across all their machines while IT Admins maintain control of the data.